For my money the assertion by many US commentators that the world is a better place without bin Laden is triumphalist bull dust. It will take a great deal more than the death of a terrorist to make the world and America, a better and safer place. 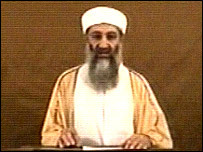 The killing of bin Laden was symbolically significant for the US. Had he been captured and tried, the result would have been a running sore, unresponsive to any known treatment. His assassination and burial at sea serve to draw a line under the events of 9/11 in a way in which bin Laden captured alive could not. The US government was aware of this. The US government knows the political value of closure, and the political risks of taking him alive. The symbolic value for the US is that they got the alleged mastermind behind the terrorist attacks of 9/11, and in getting him, restored symbolic supremacy in a way the Iraq invasion has been unable to accomplish. What this means for the reality of the daily life of many in the US is obscure. When you lose your job and your home, and you can’t pay for your medical care, is there comfort to be found in recalling that your government got bin Laden? We’ve lost our taste for lengthy, painful trials: just taking them out is so much more efficient. Whether or not bin Laden’s assassination demeans us as human beings is debatable, and probably depends on your individual moral sensitivities. In my opinion it’s no more demeaning than our invasion of Iraq, based as it was on lies about weapons of mass destruction, Western capitalist self-interest, and the linking of that country’s regime with the events of 9/11, a link that has never been established. We are collectively demeaned by our governments’ complicities, no matter what form they take. We are also helpless to prevent them. I understand the American need for expediency in the bin Laden situation, though it leaves a bad taste in my mouth. Politically there’s far more to be gained by killing him than bringing him in alive. On the other hand, the West continues to demonstrate that we operate by a set of rules that when turned against us we decry as illegal and terroristic, such as the US invasion of Pakistan’s sovereign territory, resulting in acts of murder. The West is at war and the enemy is terrorism, is the justification. The new rules of engagement require the forfeit of sovereignty by certain countries in the interests of entitled Western states prosecuting that war as they see fit. Since the 2003 invasion, some 110,183 Iraqi civilians have died violent deaths, with Coalition forces responsible for higher casualty rates than anti-Coalition forces for all weapons combined, as well as for small arms gunfire. That figure is regarded as an underestimate since the release of Wikileaks cables apparently adding another 15,000 lost civilian lives. But these lives are not Western lives and they were lost in what Western leaders considered a “just” war. No matter that bin Laden and his followers no doubt consider their war “just” and the lives lost in 9/11 similarly collateral damage. Is state sanctioned terrorism morally superior to the terrorism perpetrated by a band of cave-dwelling religious fanatics? Is the determination to impose Western liberal democracy on every country in the world itself a form of fanaticism? Nothing will change in America as a result of bin Laden’s death. The gap between the haves and have nots will continue to widen. This distance never had anything to do with terrorists, or the events of 9/11. School teachers will continue to face up to 20% reduction in their salaries as part of budget cuts. Citizens will continue to arm themselves in record numbers, in spite of the 2010 FBI statistics that reveal the crime rate has dropped. Fear will continue to govern the hearts and minds of Americans, fear of each other, fear of their government, and fear of terrorism. Those who were affected by the events of 9/11 I hope will feel some relief, and some closure. But the death of bin Laden is not going to make anybody more compassionate, generous, accepting and caring about one another. It’s not going to make the small number of Americans who hold the greatest wealth consider paying fair taxes so that others can have a shot at a decent life. It isn’t going to halt the unemployment rate. It isn’t going to house the homeless. Kevin Rudd’s apology to the Indigenous people of Australia was a powerful symbolic act surrounded by great emotion, but in reality little has changed since the apology was made. In the same way the assassination of bin Laden will bring no change to the lives of the American people who most need it. Both acts generated a great deal of emotion, but emotion is ephemeral and without the will to enact real change, emotion is nothing more than indulgence. Symbolic acts are vital in any society but they are supposed to be representative of a reality: they have no life in and of themselves. We seem to have forgotten that. We seem to have settled for the belief that the symbol, and the momentary emotional thrill it brings, is all we need. Of course it was right that Rudd should say sorry, but saying sorry was a beginning, as well as an ending. Of course bin Laden had to be hunted down, but that too is a beginning as well as an ending. Symbols mark the possibility of and hope for change. When that hope is not realized the symbol is rendered ineffective and hollow. The US isn’t your kind of place Jennifer. Something to be proud of. OK, Bin Laden’s demise might be seen as a pre-trial form of peculiar US justice but the parading of the IMF chief in front of cameras, shaming him into a world wide form of guilt I don’t see as very amicable. Desperate as I am in finding something admirable about the US, its culture of punishment and retribution is not helping much to salve my apprehension. OK, there are many writers and artists that are admirable, all huddled up in New York. Nice to have you safely back again, Jennifer. Well, I’m back Gerard, but I don’t know if I’m safe!! This trip, I really felt sickened by the US scene, and glad to escape. But as my only reason for going there is family, I guess I will continue to make the journey. The ignorance, isolationism and nationalism I encountered seemed worse than ever – are we following in those footsteps? I fear the answer is yes. Well, we ALL missed the boat circa 2007, when both neo conservatism’s and neoliberalism’s reputations were in tatters. By not moving quickly enough to repudiate failed ideologies by introducing policy alternatives quickly, the gates were left open for the Murdochist hard right to come back and next time we will not be so easily rid of them as we were when Obama and Rudd got elected. Easy come, Easy go..